The Foundation’s 2016 project list includes a rich crop of new studies. Eight new initiatives (from a total of 25) address topics ranging from paleoecology to mammalian population and community biology to microbial genetics. I hope to offer windows into several of these, beginning with a study of stream geomorphology. Dr. Chris Anderson documents the channelhead — the point at which a recognizable stream originates — of a tributary of the Salmon Trout River. Small, headwater streams in forested landscapes are important channels for movement of sediments and nutrients, mediating the complex interactions between terrestrial and aquatic ecosystems. But it turns out that these smallest of streams are not very well understood in terms of how and where they begin. 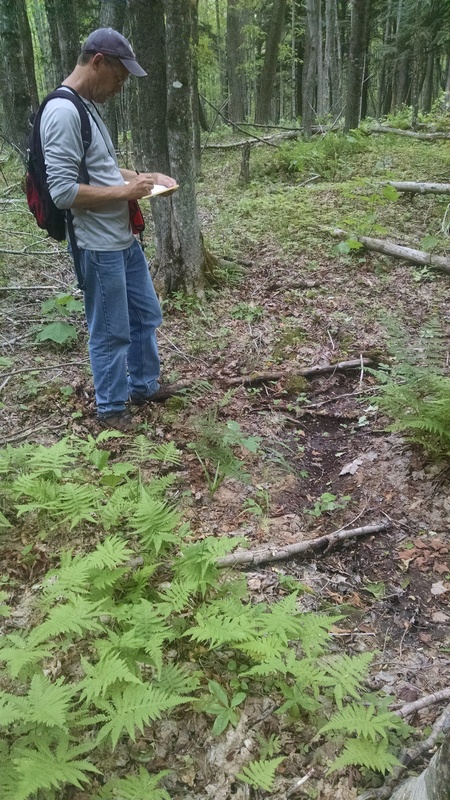 This summer, Dr. Chris Anderson, of the Forestry School at Auburn University in Alabama, began a two-year study at the Huron Mountains on the influence of forest land use on “watershed drainage density”. Dr. Anderson notes that existing maps and data-bases of ‘stream reaches’ severely underestimate the number and extent of headwater stream channels and the overall ‘drainage density’ of forested landscapes. His project will attempt to model how slope and area drained interact to determine when and where new streamheads are initiated. This approach can make powerful use of Geographic Information System (GIS) tools to better map stream heads and calculate drainage densities. But, in order for the GIS models to work reliably, it is necessary to survey a large number of actual stream-heads (the point where a stream channel first becomes evident, where the movement of materials downslope changes character, and where erosion can be initiated) to ‘fit’ the model. Geomorphologists know that slope and drainage area interact positively in initiation of stream channels (increasing either enhances the likelihood of channelhead formation). They also believe that different land-use history can strongly influence this interaction and affect drainage densities and rates of erosion and nutrient runoff. 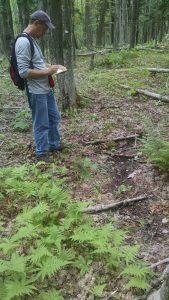 Anderson is particularly interested in understanding the effects of past logging. Consequently, as with many studies at the Huron Mts., the large areas of old-growth forest are of special value in making critical comparisons between undisturbed and previously managed watersheds. During the first summer of field-work in 2016, Anderson and his team located over 50 stream channel heads; the photograph posted here shows one example. He hopes to locate several times that number in next year’s fieldwork.